Posted: Wed Oct 31, 2007 4:25 pm Post subject: Battle Pack Alt. Models! Okay, Battle Packs. Good for minifigs? Yes, that's why the majority of people buy them. Good vehicles? Uhh... Not so much. Read any 'New sets' thread from January, and the general response to the BPs were "I'll get it for the figures and use the vehicle as part of another MOC". The Battle Pack Alt-Model Group Project! -If you don't own the battle packs, feel free to use a parts list and the appropriate software, such as LDraw or Digital Designer! -Remember, only the parts from the Droid and Clone Battle Packs (2007 and 2009), Rebel Scout Sppeder and Imperial Dropship. (Meaning 7654, 7655, 7667, 7668 8014 and 8015.) That includes the minifigures, if you like. EDIT: Oh, okay, chuck in one or two extra pieces if you want, but try not to. -No end date whatsoever. This isn't a contest. -If you're out of ideas, or just want something to start off with, see the Challenges List below. -You're allowed to submit old models as inspiration. -Feel free to suggest a challenge that you think will get our LEGO fingers working. 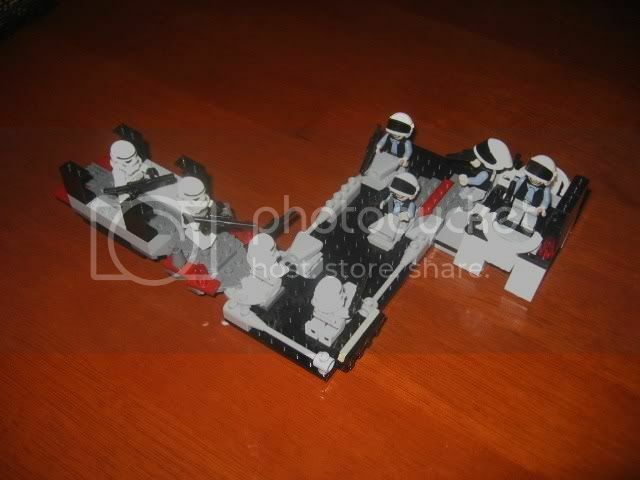 -Build Jedd's awesome lil' CLAS-Speeder by fishing around this gallery, and try to use all the pieces! -Use the leftover pieces from the Slug to build another model - the name of the game is to use all those bricks! -Make a model out of the most Battle Packs you can! The catch? You're not allowed to mix factions. 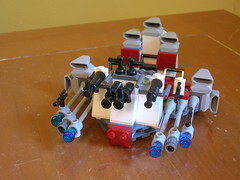 -Cross-breed a Clone and Droid Battle Pack to make an Ugly that isn't ugly! -Rook: Speeders and turrets and walkers, oh my! -Shifto Canucki: Republic MARV, Droid C.D.V. Cool! I like my BP's so i might not enter. P.S, can we use the "new 08" Battle Packs ? If you have access to time machine, I don't see why not. He probably means since there isn't an end date, once the new ones come out, if we can use those. I might enter, I love making alternate models from my battlepacks! But I usually use a few not-included pieces in them. Okay, I changed the rule on that. Well, just a little bit. After I settle into my new home, I may enter this. Since it's not a big build too, not a huge amount of rebuilding once I'm done. Thanks so much for the heads-up, Jinja! 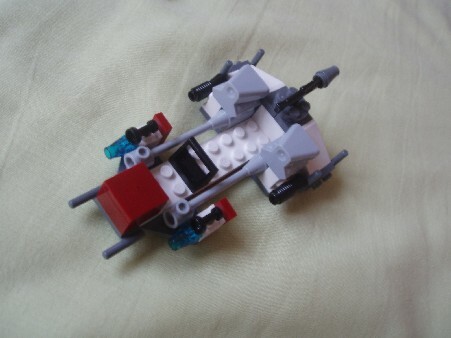 Here's a sample pic of the CLAS Speeder, using all the pieces. Might I suggest this challenge (for all those who happily horde the battle packs ) Create a vehicle using as many of the battle packs as you have! Don't mix up droid and clone parts, just use the repeated bits to pull something awesome. Of course, Jinja gives clearance first. Awesome idea, but I can't enter, because I have no battle packs. I built something alternate in March. CommanderJake, can you use LDRAW/CAd or something like that? Andi I love the little droid tank thingy with the transparent gun! I will hopefully enter this If I can get my camera back from my father. I'd just like to point out that, since some of you clearly haven't read the guidelines, if you don't have any battlepacks, you can use a CAD program, as long as you only use parts from the BPs. Well, this is designed to get people building, so entering something for the sake of entering it isn't really allowed, no. Okay, no problem. Then may be my picture a stimulant for doing it better. Wow, what a coincidence! I already built two MOCs that fit the criteria for this set over the summe! Ah, the magic of boredom, a slight distaste for the original speeder, boredom, having small sets to take apart, and boredom. I shall post pics soon. If you have access to a time machine, I don't see why not. You get one ride and that's it! See it come to an end, starting Monday 2nd February 2009. Well, here's the two things I built over the summer. For fear of large pics, this shall be a link. 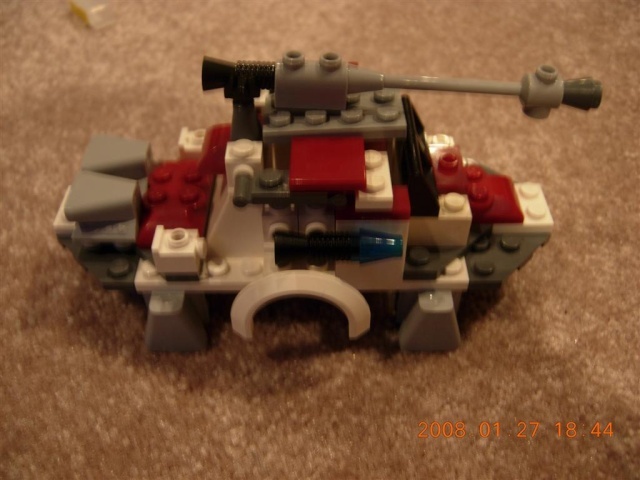 It started out with me being unhappy with LEGO's BARC speeder, so I decided to make my own. After much trial and error, I ended up with a new speeder that I adore, although it's no BARC. I love this thing way too much to ever take it apart, and there aren't enough remaning peices to build anything, so I guess you won't be seeing any new alternatve from the clones. 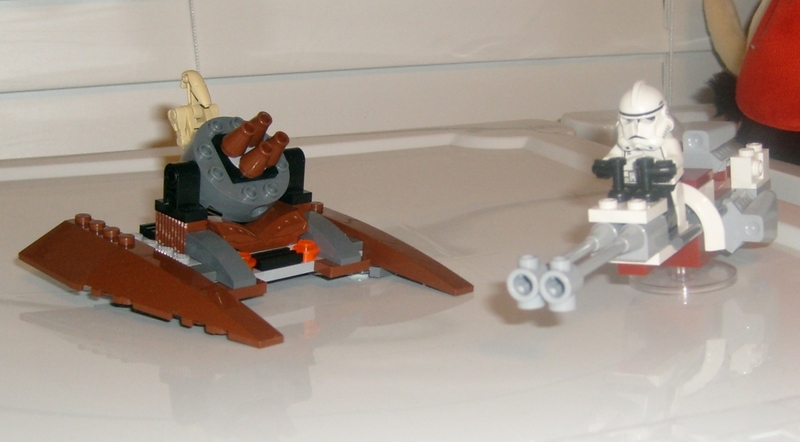 And the droid...thing emerged out of boredom and a desire to build an alternate for this set as well. It's basically a mobile anti-air turret with Quad-rockets(really spin!). So there is a possibility that you will see a better alernate from the CIS. 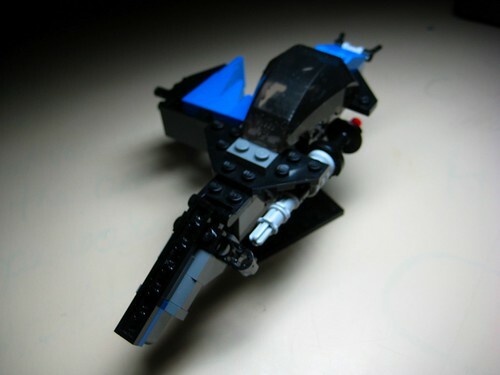 Also, a better pic of the speeder will be posted as soon as my camera gets new batteries. This is made from three battle packs. I'm not exactly sure what it is, nor have I named it. Gallery can be found here. Posted: Sat Dec 15, 2007 6:50 pm Post subject: Two questions. 1. Is there a limit to how many battle packs that we can fuse together? 2. 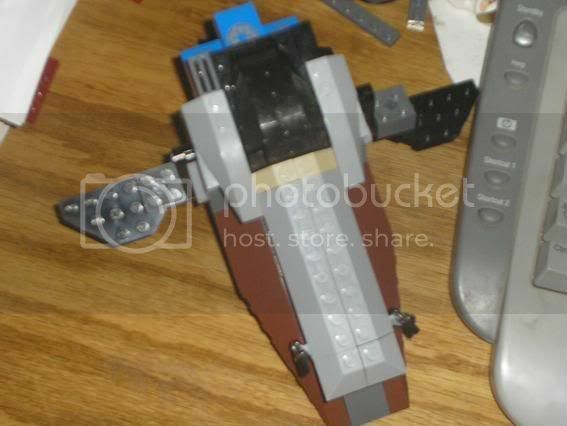 Can we cross-breed Droid and Republic parts to make a single MOC? I have one for the droids battlepack but since we only have a film camera, it could take a while for me to upload it. After practicing on a ton of LEGO SW kits, I am finally attempting my first MOC build since coming out of the "Dark Ages", so be gentle. 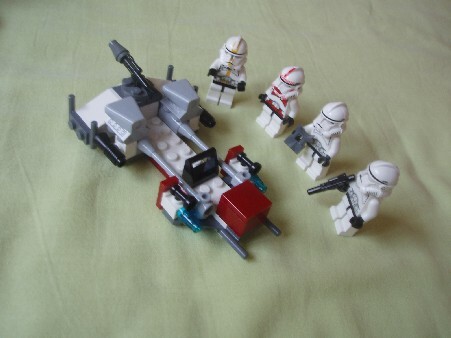 It is the product of 2 Clone Battle Packs with only a few parts omitted. Please ignore the stand (although its made from Droid Battle Pack pieces). The entire gallery can be found here on my Flickr page. The pictures are a little on the dark side as I took them without a flash. I need to figure out some kind of fill light solution. Any pointers and suggestions are most welcome. Wow! Did i kill the thread? I didn't think my MOC was that bad. Thread KILLER! No really. I'm glad this thread was started. It's always interesting to see what people can come up with, with a limited number of pieces. I would like to see similar group builds in the future. Wow... If I had a lot of money to spend on Battle Packs, I'd buy a couple right now to build that. That's really cool. I'm not sure what specifically makes it cool, but it sure is. So, no, you definitely did not kill this thread. Mobile Command Post springs to mind. 1. Unless you're trying the 'use as many single-faction Battle Packs as you can in one model' challenge, try to keep it under four, so the MOC doesn't get too 'busy'. 2. Sure! In fact, I'm going to make it a challenge! Here is one I cobbled together from pieces of 5 Droid Battle Packs. I tried to use as many of the pieces as possible but not at the expense of making it look too silly. I bought a lot of LEGO from eBay that must of belonged to a minifig peddler as there were tons of these battle packs sans minifigs...quite depressing. I am glad their existence has been justified by this group build. The gallery can be found on my Flickr page. Again they are a little dark, I'm still working on the ideal lighting setup.